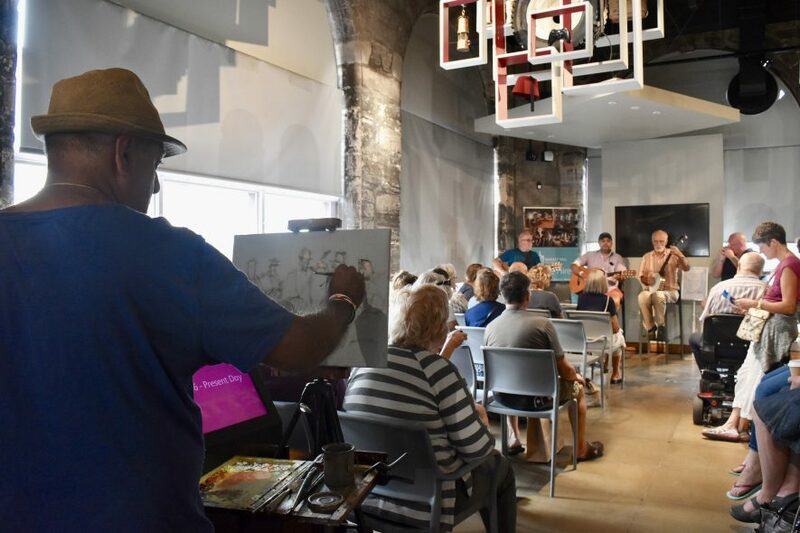 Artists at work in Market Hall Museum, 28th July 2018. On Saturday 28th of July the museum got used in a new way as a venue for the Warwick Folk Festival Fringe. We had taken part last year, but as we were not on the usual trail visitor numbers were low. This year however was very different with some great artists who pulled in over 1,000 people on the day. In the morning Helena a young contemporary artist from Sheffield, sang and played her guitar. Joel Gardner was next to perform; he has recently won 2018 – Wath Festival Young Performer of the Year. Both artists were brilliant and it was great have young artists in the museum. The afternoon was my favourite bit but I am biased as my brother and his friends played. My brother is part of a duo Under the Influence and he told me he would bring a few friends along to play as well. Well, there was about nine musicians at one point! They had never all played together before but the result was amazing. The range of instruments from guitars, banjo, clarinet, fiddle, ukulele, mandolin and harmonicas blended so well to create a wonderful sound. The atmosphere was great and it was really good to see the museum used in a new way. We had organised the event to raise funds to support our Dementia café, and the musicians busking money raised over £96. Local artist Rupam Arts also painted a picture of Under the Influence and friends. It will be displayed in the museum shortly and we will auction it at our next fundraising event to again help support the dementia café. I would love to see a regular Open Mic session at the museum, so watch out for details.